So you've modeled a character or new product design, it's time to get decorating and Cheetah3D is ready to get to work. With a powerful UV editor combined with a node based materials system you can paint and texture every model you make..
Raytracing, Global Illumination, HDRI, Caustics and much much more means Cheetah3D can produce stunning images and animations using advanced techniques .. 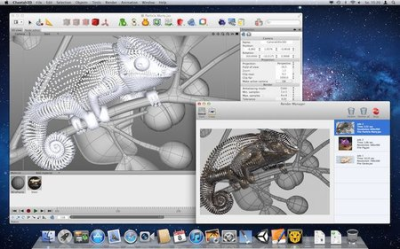 Create amazing pictures with Cheetah3D: mesmerize friends, colleagues and clients.